Ilene has worked on thousands of privately owned horses of all breeds and disciplines throughout her career. She was also the equine bodyworker and horse massage therapist for the Portland Mounted Patrol. Her bodywork services range from preventative care and maintenance, injury recovery, management of chronic issues, preparation for and recovery from shows, endurance rides, and trail rides, to the occasional “tune up." She also provides saddle reflocking, saddle fitting and basic tack repair services. Ilene is also an avid believer in providing education to the horse community. She teaches several clinics including Saddle Fitting, Equine Bodywork Basics, Equine Stretching and Yoga For Horse and Rider and a human only yoga workshop entitled Yoga For Riders and Horse Professionals. Ilene is also a frequent presenter at horse clubs, equestrian organizations and barns locally and nationally. Here's what some of her clients and clinic participants have to say…. Thank you so much for coming to teach at the OET Annual Meeting. We received rave reviews about your saddle fitting clinic from our members. It sounded like everybody learned a lot and enjoyed hearing what you had to say, and nobody wanted to leave your clinic to attend the next session. Way to go!! Thank you for coming!! 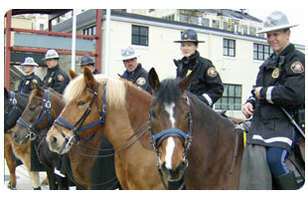 Ilene worked on the Portland Mounted Patrol for more than five years. She primarily focused on bodywork and saddle fit and also did some saddle reflocking. It was really great to have a body worker who also has extensive knowledge about how the saddle affects the horses’ musculature. If we can catch a saddle fit issue before it becomes a soreness issue, we are ahead of the game! We can then make adjustments as the horses back changes. Ilene's feedback is paramount since back issues are a nagging problem when you have inexperienced riders and a lot of standing in one spot while out on patrol. A holistic approach to treatment is vital to any horsemanship program. Our program is no different. Through bodywork, proper saddle fit, ongoing training and high quality veterinary care, we are able to get the most performance and potential out of each one of our very special horses. Ilene has shown herself to be a very professional and enthusiastic member of our team. She recognizes the challenges of overall mind and body soundness for these brave animals who work in an unconventional environment. She has a good feel for each horse and their unique needs and uses many different body work techniques tailored to each horse's situation. The horses respond willingly and respectfully. Ilene is great about sharing knowledge, answering all kinds of questions and teaching different stretches that will help maintain her work. She is also knowledgeable about riding so we can brainstorm how to work a horse through stiffness or weakness and troubleshoot from different perspectives. Thank you Ilene for keeping our boys happy and healthy! Thank you so much! Both Angel and Poncho just seem so relaxed. Their walk is now kind of more a "stride or amble." I thought it was my imagination, but Amy noticed it too. I'm definitely a believer in what you do!! So glad I found you!! Ilene is a miracle worker! My gelding, Toby, was experiencing major issues picking up and holding the right lead. I was considering retiring him from the show pen. He would contort himself every time I asked for the lead. Circles were impossible to perform. I knew he was not comfortable. After just a few sessions, Toby was transformed. Now, it is incredible to feel Toby yield so easily and willingly when I ask for a shoulder lift. He takes his leads quietly. For the first time since I've owned him, he is able to hold his hip properly. My trainer and I are amazed by the change! At the request of the Bureau of Land Management (BLM), Ilene taught a saddle fitting clinic and an equine bodywork basics clinic at the 2011 Kiger Mustang Adoption in Burns, Oregon. Ilene has a very fluid, natural teaching style that drew the participants into the clinics. She was organized, entertaining and gave a lot of depth to her topics. She is clearly a knowledgeable clinician, and demonstrably has the horse’s best interest at heart. We had great reports from those who went through her clinics. We will certainly consider inviting her to participate with our programs in the future. I was not looking forward to getting a new saddle. I knew I needed one for my horse and me, but I had no clue as to how to find a saddle that would work for both of us. I was fortunate enough to meet Ilene at an endurance riders conference. I spoke to her about my plight and also listened to her present at the conference on the importance of proper saddle fit. I was impressed with her knowledge and the way she related it in an easy to understand manner. Questions generated by the audience were answered with clarity. I was impressed and decided to take advantage of Ilene's services. Ilene met me and my horse and spent plenty of time evaluating both of us. After I decided on acquiring a dressage saddle she then suggested the brands/styles that would work for me and my horse as well as where best to find them. I found two per her suggestion. Ilene spent well over an hour studying the saddles on my horse and with me riding. She was a great teacher, educating me as to what she saw in the saddles, what I should look for, how the saddles related to the anatomy of my horse, etc. In short, she made me a more educated horse person and consumer. I purchased one of the saddles and am quite pleased. Because of Ilene, the saddle buying experience I was dreading turned out to be quite satisfying. I LOVE my saddle!! Great saddle fitting clinic, Ilene!! Check out my blog. Ilene has done bodywork on my mare, Roma, and a saddle fitting for Roma and I. I am very impressed with her thoroughness and attention to detail. Ilene has a nice, calm presence and Roma was quick to trust her and let her do whatever was needed. Horses are so honest and mine was telling me in the only way she knew how that her saddle did not fit. Since finding a saddle that fits us both with the help of Ilene, Roma is much more relaxed, forward, and willing. Recently she has offered some HUGE extended trot strides that I have never ridden on ANY horse before!! The other night we had a lesson, and Roma moved the best she has ever moved since I have owned her!! I will continue to have Ilene work on my horses and my saddle. I can most highly recommend her services. Thanks, Ilene, for all your help. You're amazing!! Ilene is the most professional equine massage therapist I've ever worked with, and I can recommend her without hesitation. She continues to do amazing work, allowing my show horse, Chase, to perform at his best. Ilene is also an exceptionally reliable ranch-sitter. Not only does she follow our very detailed instructions, she also competently handles issues as they arise. Now we can leave town without worrying about what's happening back at the farm - what a relief! Our Modern Shetland stallion, Toby, was having issues with shaking his head while being driven. It was so bad that a couple of times he shook his bridle off while standing in line. He also would not let anyone touch the right side of his head. After a particularly harrowing drive, I contacted Ilene to take a look at him. She found a number of tight areas including a lot of tension in his poll and around his right eye and his left pectoral and leg muscles. After a couple of treatments, his head pain and poll tightness were gone. His leg and pectoral tightness also resolved after a just a few treatments. He now willingly accepts having his halter and bridle put on. He has since drove beautifully and finished his points for his Supreme Championship. We love working with Ilene and, more importantly, Toby loves her!! We just wanted to thank you again for coming out today and seeing Trey. As you know, he means a lot to us, and it's reassuring to know that he's getting such wonderful care. You're the best, and we're so very grateful to you. Carrie M. and Rodney P.
In February of 2007, my mare, Sophie, fell and injured herself. We did not see her fall but think she went down with her legs out behind her, pulling all sorts of things along the inside of her legs and in her back. I had the vet take x-rays, a chiropractor visit several times, plus acupuncture treatments. Each practitioner had different ideas on what I should be doing to get Sophie sound again. By early December of 2007 I had tried twice to gradually to bring her back into working condition; all would be going well and then as soon as I asked her to use her back, she would be lame again. In April, I started to ride Sophie again, at a walk, for a few minutes at first and week by week adding time. By May we were working on walking over poles, plus doing circles and serpentines. By June Sophie and I were back to our dressage training. Sophie is now completely sound and a much happier mare. Ilene visits occasionally to check on our progress. Ilene identified Sophie’s problems and came up with a plan for Sophie’s recuperation. Ilene has an excellent manner with horses (and people) and is sensitive to the horse’s needs. It took about six months working with Ilene to heal Sophie compared to almost a year before that when she was lame, and I was trying various other treatments. I originally went to Ilene for a saddle fitting. She had come to the barn where I take lessons to do a saddle fitting clinic. My young gelding, Dekes, is a short wide backed Morgan/Friesian mix, and I wondered which of my many saddles fit him the best. None of the saddles I brought to the fitting worked for him, so Ilene gave me some saddle recommendations. We also decided she would do body work/massage. My confidence with Dekes has been limited since he broke my hip several years ago. Working with Ilene has built my confidence tremendously and alleviated Dekes' tightness. Oh yeah....We also found a saddle that fits both of us that I’m very happy with. About a year after Ilene helped me find my saddle, I was taking a lesson. My instructor calmly said my girth broke while I was doing a canter depart. I guess I didn’t believe her because I was still sitting squarely in the saddle on his back . My instructor then told me more strongly that my GIRTH BROKE! I’m still not sure how, but the next thing I know I’m standing on the ground next to Dekes and my saddle is still sitting perfectly balanced on his back with the girth swinging freely below his belly. Now that is a well fitting saddle! Thanks for your help getting a saddle that fits my horse and me so well it doesn’t fall off even without a girth. All in all, having Ilene work with Dekes and I has been a great investment.